Happy Friday everyone! I know I keep giving you excuse after excuse for not posting more frequently and honestly from the bottom of my heart I am sorry. I've just been so busy lately with everything and when I do get the chance to work on my blog I've been slaving over changing the layout and photos, which is ending up being more of a project than expected. But I'm really excited about how the blog will look and I think you will like it also! Anyways, on to Food Friday! I made this dish last Sunday for my family "Sunday dinner". Every Sunday since I was a child we have always had a big meal after church or in the evening, and this week I wanted to try out a new recipe I had found and was excited about. 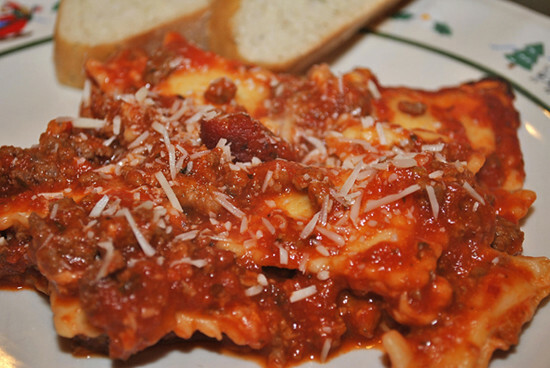 It combines two of my favorite dishes-ravioli and lasagna! I made a few changes to the recipe as I made it. 1. I 1 1/2 the recipe so it could feed a larger crowd and added extra sauce. I like to have something to dip bread into. 2. I pan cooked (browned) hamburger and then added the sauce to the hamburger before adding it to the casserole dish. This recipe is so very very easy, quick, and super delicious. You can find the recipe HERE. I guarantee if you are hungry for a pasta dish and want some thing quick and delicious that this dish will not disappoint! I'm craving it just looking at these pictures! Again- recipe can be found HERE. Now that I'm feeling better and the weather is getting nicer I'm hoping to do some photos this weekend and get back into the blog grove :) I hope everyone has a wonderful weekend! yum! and looks super easy!